Director notebooks look significantly different, as it typically reflects their vision and style for a given story. Notebooks can be physically made up of a set of three ring notebooks, a single sketchbook, a diary type book, a digital book, or any combination that allows the director to capture and easily get at his ideas for the film’s look and feel. Notebooks typically hold certain information regardless of the director’s taste. Software packages exist that help the director create a digital notebook. Unfortunately, the digital books lack templates or forms for many things that a director needs to capture. Regardless of style, creativity and inspiration, most directors’ notebooks hold information to meet the director’s requirements for casting his vision to each department head. Many directors add the department heads’ notes and illustrations to their notebook as they become available. Script: (All Department Heads and Principals) Some directors use a master script marked for shooting, while others use a shooting script. Regardless of the markings, it is important for the director to talk through the script with his department heads to transfer his complete artistic vision and notes. Development or Director Sheets: (Director’s Eyes only) This sheet includes any key elements a director may need during the shoot when working with talent. Many directors mark these notes directly on the script rather than having a separate sheet. The content is broken down by scene and includes: Through Line, Motivation, Entrances, Literary Devices, etc. It also includes motivational verbs of varying strengths to help the actors increase or decrease the intensity of their performance. Beat Sheet: (Director’s Eyes only) This sheet includes the breakdown of the story’s beats, turning points, emotional charting and story conflicts. These elements help the director to focus on the actors’ performance and each character’s shift in power. Character Sheets: (Casting Director) This sheet spells out the key characteristics, age, and other elements necessary for the Casting Director to filter down potential actors for the director’s selection. Character Development Sheets: (Production Designer, Costume Designer, Hair Stylist and Make-Up Artist) Descriptions, thumbnail sketches or photos of the director’s ideas that reflect the look and feel of each character including physical stature and appearance, clothing, make-up and hair style. Action Props & Vehicles Sheets: (Production Designer and Property Master) Descriptions, thumbnail sketches or photos of the director’s ideas that reflect the vehicles and props including how it is used. Set Design Sheets: (Production Designer, Set Designer and Set Decorator) Descriptions, thumbnail sketches and photos of set ideas that reflect the look and feel of the set are included. Shot Lists: (Director of Photography) For some directors the shot list is nothing more than an actual list of shots per scene. Other directors embed their shots into the script using the same markings as the Continuity Supervisor. 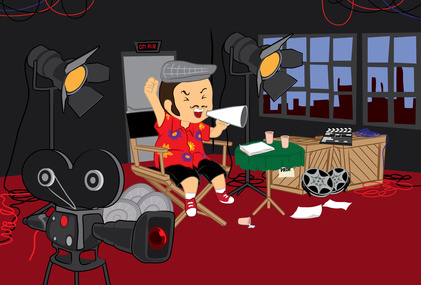 Most directors add blocking diagrams and set-up cards showing the actor’s movement and the camera positions that match the shot list. Lighting Notes: (Gaffer, Director of Photography and Production Designer) These notes are limited, but give a good sense to the team in advance for altering blue prints or designing set-ups to conform to the imagery and mood of the director’s vision. Physical Effects & Stunt Sheets: (Special Effects Supervisor and Stunt Coordinator) These sheets typically include the visual outcome the director seeks and the story elements leading up to the moment. This is all discussed in advance in case set alterations or camera equipment will be impacted by the functional operation decisions. Contracts: (Production Manager and Line Producer) Having a set of contracts on hand quickly reduces arguments and helps the director, production manager and 1st AD determine appropriate overtime if needed. Script Breakdown: (1st AD, 2nd AD and Production Manager) The Script Breakdown determines workload and helps the team create schedules for cast, crew, vehicles, props, wardrobe, etc. Location Sheets: (Location Scout and Location Manager) This includes location contracts, contact information, location photos, nearby hotels, etc. Production Sound: (Sound Mixer) This list covers the ambient and unique sounds required by the story. The more locations sounds captured, the less foley work will be required in post. Editorial: (Film Editor) While the editor gets the Continuity Supervisor’s notes, the director still needs to share his vision for how he sees the story coming together. Visual Effects Sheet: (Visual Effects Producer/Creative Director) Storyboards tend to fill in these pages to provide discussion on technical requirements in production including the shooting of background plates and matte work. Sound/Music Sheets: (Sound Designer) This sheet includes a list of critical sounds and music samples that reflect the style and mood the director desires to capture for each scene. The most productive directors use notebooks to save time and money. Flipping to a certain page is much faster than trying to remember all the details of every scene. Some directors only use the notebook during prep time the night before a shoot or when in meetings with department heads, while others keep it with them on the set for last second decisions. In either case, the notebook is the production bible for the film.